Senate Republicans on Thursday said that they will come up with their own version of legislation to repeal and replace Obamacare rather than vote on the bill that House Speaker Paul Ryan (R-WI) and colleagues in the lower body of Congress have spent weeks hammering into passable shape. Twelve lawmakers are working on a Senate proposal that may incorporate elements of the bill passed Thursday by the House, the Washington Examiner reported, but it will not be based on the current measure. However, I have three e-mails from Democrats in my inbox telling me that Obamacare was repealed. 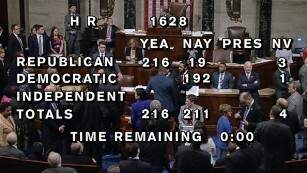 Last I checked, it takes both houses to repeal a bill. So what's up? How upset should I be right now?